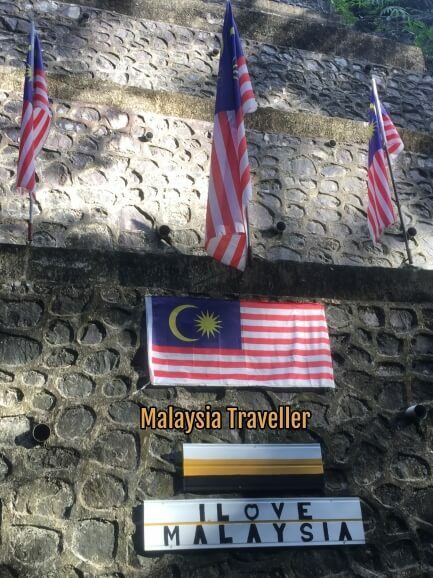 Bukit Larut on foot is not the easiest way to go up this 1,035 m high hill overlooking Taiping (formerly called Maxwell Hill). It is pretty exhausting but worth it for the nature, clean air and scenery. 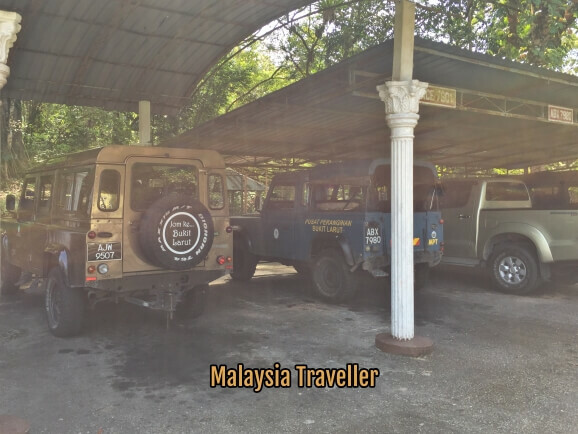 Last time I went to Bukit Larut I took the Government Land Rover service, which is the most sensible way to go, especially if you want to reach all the way to the summit. 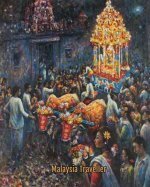 I wrote about that trip here. 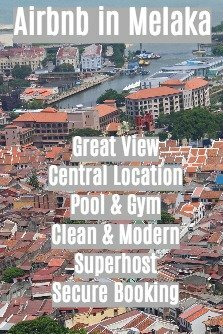 The main area where the bungalows are located is 10km away from the starting point. All the way to the telecom tower is 14.4km! This time I thought I would try hiking up it. I had no intention of reaching the end (14.4km away) so I gave myself 2 hours to see how far I could reach and then I would turn around and come back down. 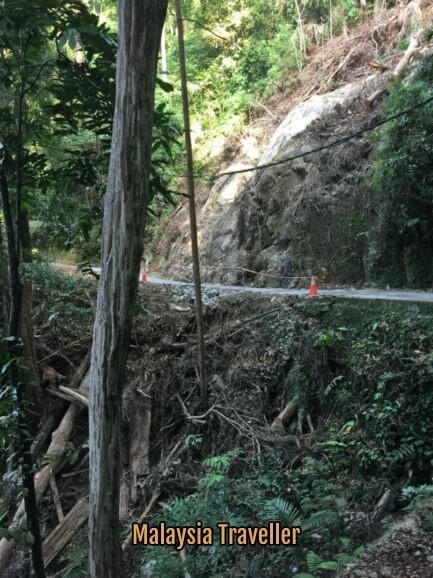 The road needs to be constantly maintained against landslips. I decided to stick to the tarmac road all the way. 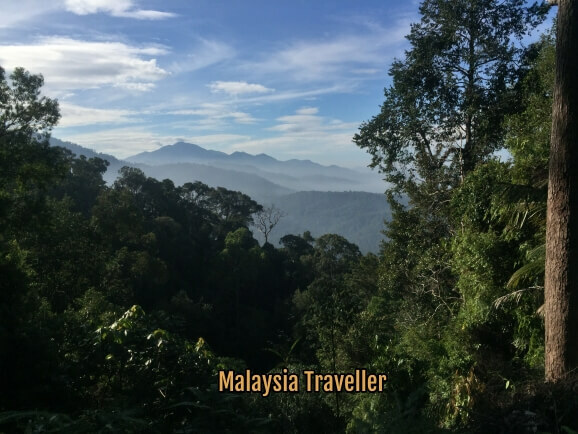 It is possible to take a short-cut through the jungle for the first part of the hike which brings you out at Pondok 3 (3rd Hut) where you rejoin the tarmac for the rest of the walk. The tarmac road is traffic free, being only used for access by occasional telecom vehicles wanting to reach the telecom tower at the peak or other service vehicles. It is also used by the Government Land Rovers (only 4 round trips a day). When you are hiking in the clean unpolluted air here you really notice how noxious the fumes are from the Land Rovers. Makes you realise the filth we fill our lungs with every day when walking round our cities! Sound Your Horn. Yes, you can blow your own trumpet if you've managed to walk this far. 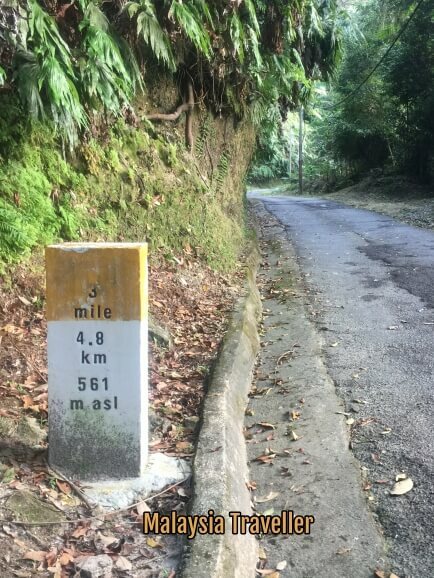 Since the road was built for vehicles the gradient is not too extreme and quite good for hiking though I would warn you that the walk is a relentless uphill climb. There were a surprising number of walkers on the road for a weekday morning but by 9.30 am they had mostly disappeared, gone for breakfast or to work. Not half way to the upper Land Rover station yet. I saw a fair amount of wildlife including a family of gibbons and numerous brightly coloured birds. After 90 minutes of exhausting walking I reached the Tea Garden where I was demoralised to see this map showing that I had only come less than 6 km from the start and less than half way to the top. Tea Garden, once a tea tea estate but long since abandoned. 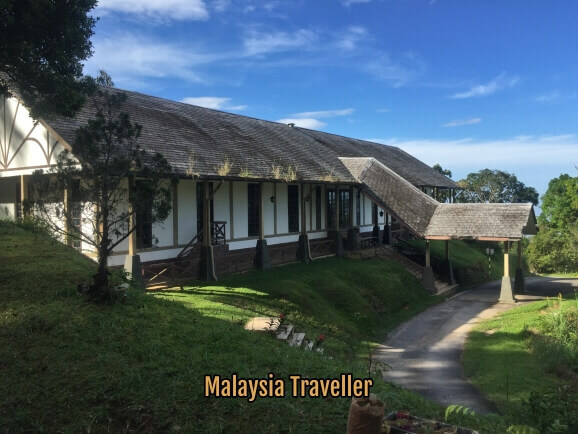 The Tea Garden building, at 656 metres above sea level, has unfortunately been semi-abandoned for many years. Pity, I could have done with a cup of tea. I decided to walk on a bit further as far as the waterfall (7km from the start) and then turn around. At the waterfall I met a gentleman called Barry, aged 65, who said he climbs this far every day and at weekends he continues all the way to the end (28 km round trip). He said the exercise has cured his asthma and other ailments. I was impressed! The waterfall was weaker than usual due to lack of recent rain. 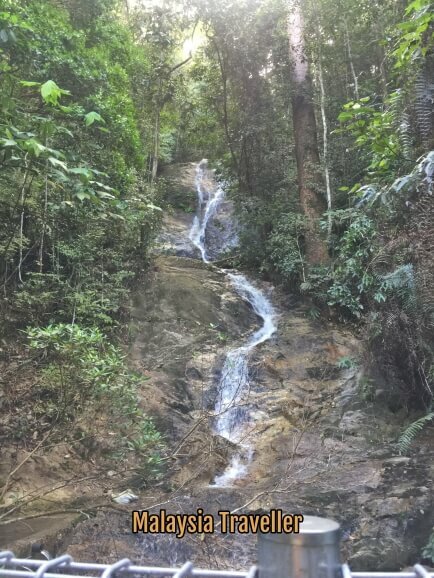 The waterfall was not as impressive as on my previous trip but the air at this altitude was refreshingly cool by Malaysian standards. It was time to walk back to my car at the foot of the hill. 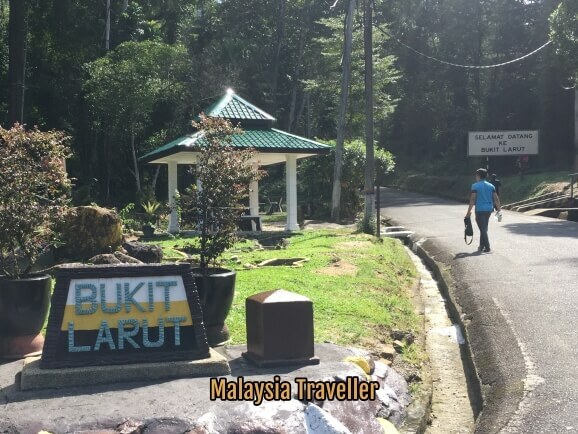 I enjoyed exploring Bukit Larut on foot. My total walking time up and down was about 3.5 hours. 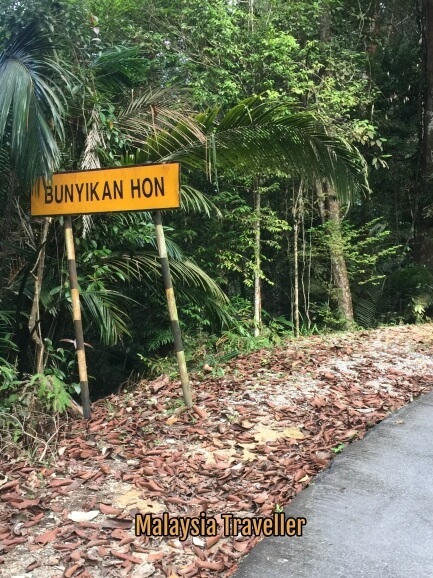 It was quite strenuous but at least it was a lovely day and there was none of Bukit Larut's notoriously rainy weather. Next time I'll take the Land Rover. 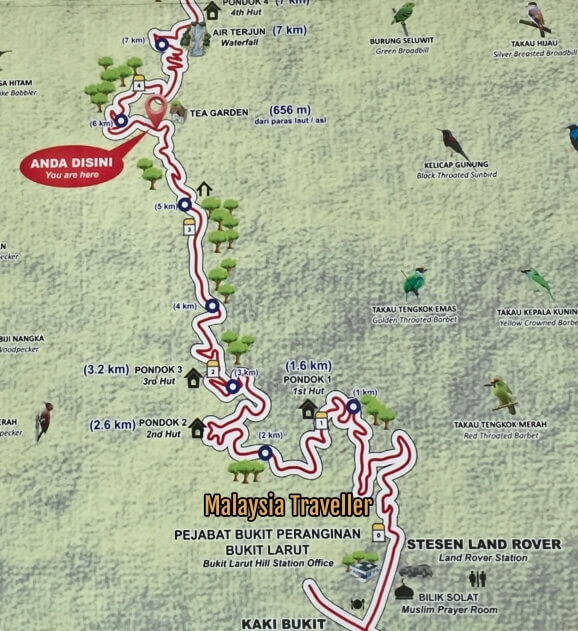 The location of the Bukit Larut Land Rover station and office is marked on this map. This is where you start climbing. You'll need to find a roadside parking space near the entrance to the hill.